Is the Best Choice the Wrong Choice? Most of us search for the �best�. We want the best of whatever it is: restaurants, movies, husbands, wives, houses, careers, jobs and so on. If we pick the wrong restaurant or movie, the consequences are insignificant. But selecting the wrong spouse, house, career or job could have major consequences. Yet, frequently in our search for the best, we make the wrong choices. Here�s why this happens. Picture a barrel of rotten apples that are standing on the curb awaiting the garbage truck. Peek into the barrel. Search for the best. Pick one. What do you have? A rotten apple. If the person you picked to marry is one of those rotten apples, you made the wrong choice. You do not want to compare and contrast rotten apples to make decisions, especially those that have major consequences. What should you do? When I was six years old, my dad, a cantor in a synagogue and I would walk hand in hand through the streets of my hometown Brookline, Massachusetts, the birthplace of John Fitzgerald Kennedy. I watched him greet and talk with person after person. After each conversation, he asked me, �What did we say?� He did not want me to recall the words that were exchanged, but the meaning behind the words. He wanted me to explain with whom he was �dealing� so I would never miss the �real� message. Later in life, I realized the significance of what my dad taught me. I had learned how to �read� people with very little information about them, a necessary skill if you are trying to figure out whether they are the Right Fit for you or could be the Right Fit, after successful negotiations. My dad�s teachings continued. When we went to the market, I learned to shop with standards. The focus was always high quality. For example, I knew exactly how to select bananas. I didn�t compare and contrast bananas to find the best. I excluded the bananas that were brownish and overripe as wrong fits. Then, I proceeded to search for those bananas that matched my dad�s specifications. When we finished shopping, we left the market with brown bags filled with Right Fits! As I was growing up, I began making all my decisions implementing the Standard of the Right Fit, from selecting friends to moving to Los Angeles at age 21. My dad walked me down the Right Fit Road which motivated me many years later to create the Right Fit Method, the subject of my book WIN Without Competing!. I marvel at those people who consistently find Right Fits, especially spouses. One person in particular stands out. She is a native New Yorker, now 81 years old, who has always lived on the east coast. She has been widowed three times. Her first husband died in a car accident, her second died of cancer, and her third from Alzheimer�s disease. What�s unique about this woman is that she selected three Right Fit husbands, and I believe that she could select a fourth. After her third husband died, she told me that she was planning to join a bereavement group. I believe she has the capacity to grieve for the husband she lost and simultaneously reach out to another man, who could potentially become her fourth husband! She clearly articulates exactly what she is searching for and has a precise blueprint of the Right Fit to which she will find the match. She discards wrong fits quickly, as if they are rotten apples. She is very vocal about what her needs are prior to marriage, to assess and confirm the extent to which her prospective husband will meet her needs. Early on in her third marriage, she had a bilateral mastectomy followed by reconstructive surgery with complications. With steadfast loyalty, her husband expressed unwavering love, devotion, and support during these challenging times. When he was suffering from Alzheimer�s, she cared for him as he had for her. Once you understand how to find a Right Fit, e.g., a husband, (like my friend Evelyn, who found three) you then have the capability to find other Right Fits. Wrong Fit: Fix It or Flee? Perhaps, you are in a wrong fit situation right now. Here are the choices. You can endure the pain, try to fix the situation or leave. For example, if you are in a wrong fit job, you certainly do not want to walk out the door in this economic climate. Doing nothing about you situation is not a good idea. I have mentored many who have become physically sick from the stress and strain of their jobs. They either fail to recognize early warning signs or plan ahead to prevent potential problems. A common complaint is �I did not get the promotion I wanted�. It�s up to you to set the stage for the promotion that you want. As soon as you take a new job, the promotion planning begins. Do not assume that your work will speak for itself. You need to do the speaking. What that means is that every quarter you must write a report detailing your accomplishments. Focus on what you achieved not what you did. It�s the results that count! Connect to your passion, which is the career fuel that you need to propel you to success. Be realistic. For example, do not write that you will relocate, if you really do not want to move. Do not assume that you must pursue the same kind of position that you currently hold, especially if there are only a few positions available in your field now. To help you design your blueprint, I created a special template. Email BlendedBlueprints@WinWithoutCompetiting.com and you will receive a form on which you can write. Use your completed Blended Blueprint to serve as a Roadmap to the Right Fit position. If you decide to search for a new position, keep in mind that finding the Right Fit is not easy. You will need to demonstrate to the employer that you are the one Right Fit. The goal is to find an exquisite fit between you and the employer�like the interlocking pieces of a puzzle. It is not easy to do, but you can do it. 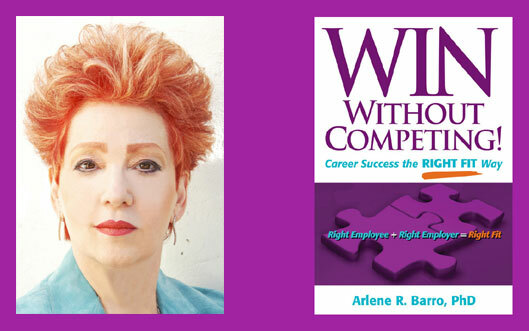 Arlene R. Barro, PhD, creator of the Right Fit Method, is a UCLA-trained educator and educational psychologist, who is an author, master coach, professional speaker and talk-show host. She is the founder and CEO of barro global search, inc., based on the Westside of Los Angeles. Call Dr. Arlene at 310-443-4277 or email DrBarro@barroglobal.com to arrange a time to speak to discuss your Right Fit needs. WIN Without Competing! is available at Amazon.com.